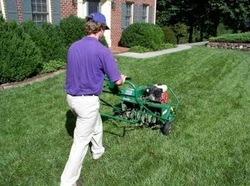 AERATION IS THE #1 MOST HIGHLY DEMANDED LAWN SERVICE IN THE SPRING! AS WELL AS THE MOST BENEFICIAL TO YOUR LAWN! See bottom of page for information on essential services that will increase the effectiveness of core aeration. 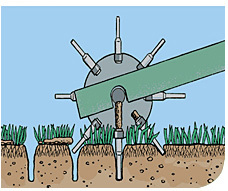 Technically speaking, aeration is the natural exchange of soil and air. Practically speaking, aeration is the process of mechanically removing small plugs of thatch and soil from the lawn to allow water, air, and nutrients to get deep down into your soil. Core aeration takes an up to 3 inch core of soil out of your lawn, that comes from under your lawn which is much more rich and nutrient soil, and drops this soil on top of your lawn so at the next rainfall, this soil will then soak into the top of your lawn and provide numerous benefits to your lawn and soil. In most residential lawns, the natural soil has been seriously disturbed by the building process. Fertile topsoil may have been removed or buried during excavation of the basement or footings, leaving subsoil that is more compact, higher in clay content and less desirable for healthy lawn growth. These lawns need aeration to improve the depth and extent of turfgrass rooting and to improve fertilizer and water use. Most home lawns are subject to thatch accumulation. If thatch is left unmanaged, it can lead to serious maintenance and pest problems. For example, thatch accumulation of more than ½ inch on a lawn impedes water, fertilizer and pesticide effectiveness. Core aerator reduces thatch accumulation, minimizes its buildup and modifies its makeup by incorporating soil into the thatch. As soil combines with the thatch debris, soil organisms are better able to break down the thatch and reduces its accumulation. Thatch accumulates faster on compacted soils, heavy clay soils, and subsoil's that are disturbed during building processes, than on well-aerated soils. Therefore, lawns require frequent aeration to prevent that buildup. Most home lawn growing on heavy clay or highly compacted soils require annual or multiple aeration to restrict thatch accumulation. It is ideal to have the lawn raked of any leaves/branches before aerating. As well, a light raking of the entire lawn will help pull up thatch in the lawn and increase the effectiveness of the lawn aeration. Over-seeding and/or fertilizing is most effective immediately after aerating your lawn. After aeration, your lawn and soil are completely opened up and ready to absorb water, nutrients, sun, as well as fertilizer and over-seed. These services, as well as any of our other services, are all available at the time of aeration!